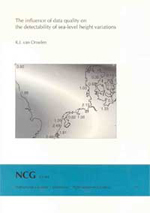 Publications on Geodesy 49, Delft, 2000, 220 pagina's. ISBN-13: 978 90 6132 273 3. ISBN-10: 90 6132 273 1. For low-lying areas like the Netherlands, an ever-increasing sea level can become a serious threat. This is especially true if sea level rise accelerates, e.g., due to greenhouse-gas induced warming. To anticipate potential troubles, it is important to have a good estimate of the expected behaviour of future sea levels. This requires an accurate description of the present-day sea level variation curve and of foreseeable changes in this 'natural' pattern in the near future. These changes in the behaviour of future sea levels can be based, e.g., on models predicting global change, but this is beyond the scope of this thesis. Much simplified, sea level rise over the last century could be described by a linear regression line. Accelerations of this 'natural' pattern have occurred if the slope value of the regression line increases, or higher order regression coefficients are required to describe the sea-level rise curve. The better the natural sea level variation curve (as has occurred over the last century) can be determined, the easier it will be to detect a significant divergence from this curve. The objective of this thesis is to determine how well patterns in sea level height variations can be detected, given the limited quality of the data available. The objective of this thesis requires long sea level height time series. Therefore, only tide gauge data has been used and altimetry sea level height series have not been considered. Tide gauges measure sea level heights relative to the tide gauge bench marks. Consequently, the resulting sea level height time series show both variations in absolute sea level and vertical movements of the tide gauge bench marks. By monitoring the height changes between the tide gauge bench marks and a stable reference height, these relative sea level heights can (in principle) be converted into absolute sea level changes. Unfortunately, locating a reference point which is truly stable over long time spans will be extremely difficult, if not impossible. How well a specific sea level variation pattern can be detected depends on the sea level variations themselves, the quality of the tide gauge measurements and, if applicable, the quality of geodetic measurements used to connect the tide gauge bench marks in height. Based on existing literature, it has been tried to gain a clear understanding of these various aspects. Unfortunately, in the literature studied on processes which can influence relative sea-level heights, (almost) no mention is made of long-periodic processes (periods over 20 years), while analysis of tide gauge records shows that long-periodic fluctuations with significant amplitudes do occur in sea level height time series. Sea level heights as used in this thesis are annual mean sea levels. The quality of these annual mean values not only depends on the quality of the tide gauge measurements, but also on the frequency of these measurements. Not only the quality of state-of-the-art techniques is important, but also of tide gauges and measuring frequencies which were used in the past. Since estimating long-term sea level variation curves requires long sea level height series, historical measurements have to be used as well. In chapter 3, an overview is given of the measuring precision and systematic errors and limitations characteristic for the six tide gauge systems commonly used during the last century. Based on information available for Dutch tide gauges, an estimate is given of how much the quality of annual mean sea levels deteriorates if mean values are based on, e.g., mean tide levels instead of on hourly measurements. If data for a number of tide gauges is available, a common sea level variation curve, e.g., applying to the Dutch coast, can be estimated. Since tide gauge measurements are relative to the local tide gauge bench mark, any vertical movements of the tide gauges relative to one another will have introduced inconsistencies between the individual time series. These inconsistencies reduce the quality of a common sea level variation curve based on these tide gauge series. As long as tide gauges experience only secular height movements relative to one another, the common oscillation pattern can still be discerned using techniques like SVD. However, the slope of the estimated common variation curve is determined by the rate of vertical movements of the individual tide gauges. If tide gauges undergo vertical movements which vary in rate and over time, the common oscillation pattern will be affected as well. By relating all sea level height series to the same reference frame (e.g., NAP) internal differences in relative sea level due to vertical movements of the tide gauge bench marks are removed from the data sets. Ideally, permanent monitoring of the tide gauge bench marks is applied. Nowadays, this can be achieved by means of GPS. However, in the past height differences were usually based on spirit levelling. In chapter 6, the quality of three geodetic techniques, i.e., GPS, gravimetry, and spirit levelling is described. In addition, limitations of these techniques when applied to monitoring height changes of tide gauge bench marks are discussed. Since changes in local gravity represent both variations in mass and changes in station height, gravimetry is not well suited for determining height differences. Uncertainties in height differences obtained by GPS can be reduced to within 1 cm. However, the quality of these measurements might be less in harbour areas (e.g., due to signal interference). GPS has the advantage that it allows for permanent monitoring over large distances, but measurements are only available for the last few decades. Spirit levelling can produce high precision height differences (over short distances), but is time consuming and prone to systematic errors (especially over long distances). However, levelled height differences are often the only type of height information available. In the past, tide gauge bench marks have (hopefully) been connected to a local reference frame. Between some neighbouring local height datums, height differences have occasionally been obtained as well. However, only since the second European levelling network (UELN-73), the height difference between the continent of Europe and Scandinavia and Great Britain respectively is available. These height connections consist of only a single connection line and, consequently, errors in these height differences cannot be detected by testing. In chapter 8, an indirect method is introduced for connecting vertical datums, which results in dynamic height differences between the fundamental stations in the various height datum zones. An advantage of this method is that quality information (both precision and reliability) of the estimated height differences can de determined as well. Unfortunately, a high quality potential coefficient model is required. As a result, only if a new model (to be obtained from the planned goce mission) becomes available, height differences between datum zones could be derived with standard deviations of 1 cm. The quality of sea level variation curves depends on the method used to estimate these curves. A number of data analysing techniques have been tested for their suitability for working with sea level height data. Sea level height time series have a number of specific characteristics, for instance non-stationarity, data quality which is not constant for the complete time series, and a wide range of periodic fluctuations with sometimes variable frequencies and amplitudes. As a result, most of the techniques examined do not work well when applied to sea level height data. It is found that the best techniques for smoothing sea level height series are moving average smoothing and Singular Spectrum Analysis, while estimates of future sea level heights should be based on either AR(I)MA modelling or regression. To determine how well specific sea level variation patterns can be detected, experiments with a large variety of simulated sea level height time series have been performed. These simulated time series consist of the curve which needs to be detected (e.g., a linear trend), periodic fluctuations (based on actual tide gauge data) and simulated additional errors. This can either be inaccuracies introduced by the tide gauge equipment or the height measurements, or (uncorrected for) height variations between tide gauge bench marks. By applying regression to the simulated time series, it is examined whether or not the original sea level variation curve can be recovered. It should be noted that statistical significance of estimated regression coefficients is no guarantee that the 'true' sea level variation curve is detected. For example, if linear regression is applied to a sea level series following a quadratic curve, the estimated trend value can still be statistically significant. For this reason, often trend estimates are shown as a function of an increasing number of observations. For the above mentioned example, estimated trend values will steadily increase with an increasing number of included observations. Only if the model (of a linear regression line) fits the data, and if enough observations are available, estimated trend values will stabilise around the trend value actually present in the data set. First, experiments have been performed with sea level height data for a single tide gauge. In this case, the original data relative to the tide gauge bench mark can be used. If (based on external knowledge of the behaviour of the local sea level) long-periodic fluctuations could be eliminated from the data set, the detectability of a single linear regression line depends on the trend value and the noise level of the measurements. For sea level data with a trend of 1.5 mm/yr, even if a noise level of 5 cm applies, this trend can be detected if 35 observations are available. If a simulated time series contains long-periodic fluctuations based on data for tide gauge Den Helder, of the order of 90 years of observations are required before trend estimates stabilise around the actual trend value on which the data set is based. Therefore, it is concluded that long-periodic fluctuations are the main factor in determining the amount of data required to detect a linear trend in a sea level height time series. In chapter 7, using six tide gauge data sets, a common sea level variation curve for the Dutch coast is estimated. In order to eliminate deviations from this common curve caused by height variations of the tide gauge bench marks relative to one another, all tide gauges have to be connected in height to the local reference system (NAP). Inaccuracies in the required height connections introduce inconsistencies between the time series. Since the actual height connection history for the tide gauges is unknown, a number of scenarios have been used to simulate height connection errors. Experiments show that the quality of the estimated common variation curve not only depends on the precision of the height measurements, but also on the time span between subsequent height connections. For higher levels of connection noise, it is more pronounced that the larger the time span between subsequent connections, the less dependable the estimated trend values will be. In order to detect future sea level rise accelerations, historical data has to be used as well. Experiments show that, if long periods have elapsed between historic height connections, the precision of future height connections is of almost no importance. Increasing the standard deviation of future height measurements from 5 mm to 2 cm, or increasing the time span between height connections from one to 10 years, hardly influences the results. Finally, for the North Sea area, the quality of spatial variation patterns which can be derived based on trend values for 18 tide gauges, is examined. A spatial pattern in sea level height variations should be based on real differences in trend values for the various locations and not on variations resulting from measuring errors and height changes between tide gauge bench marks. Based on experiments with simulated time series, the following conclusions have been made. If height connections to a local reference frame are performed every 10 years, ranges of errors in trend estimates (as a function of latitude and longitude) are three times as large as results based on annual connection of heights. As a result of, e.g., post-glacial rebound, fundamental stations in the different datum zones can experience height changes relative to one another. If the individual time series (connected to the local datums) are not corrected for these relative vertical movements, this will result in large errors in the estimated spatial variation pattern. If height differences between vertical datum zones are based on results derived for European levelling networks, resulting errors in trend values (as a function of latitude and longitude) will be much larger than those caused by the post-glacial rebound movements (of the selected fundamental stations: Amsterdam, Newlyn, and Helsingborg) itself. This same holds for differences in vertical movements obtained by GPS measurements with a standard deviation of the order of 1 mm/yr. Zelfs al is de gemiddelde zeespiegelstijging klein, voor laaggelegen gebieden zoals Nederland kan dit op de langere termijn een flinke bedreiging vormen. Deze problemen verergeren als het tempo van zeespiegelstijging versnelt, bijvoorbeeld ten gevolge van het broeikaseffect. Om zo goed mogelijk op potentiële problemen in te kunnen springen, zijn goede voorspellingen van toekomstige zeehoogtes nodig. Hiervoor zijn twee dingen nodig, namelijk inzicht in het patroon dat zeehoogtes tot nu toe hebben gevolgd en te verwachten veranderingen ten aanzien van dit 'natuurlijke' patroon. Deze veranderingen in het natuurlijke patroon kunnen worden gebaseerd op een GCM (global change model), maar dit is een onderwerp dat niet in dit proefschrift behandeld wordt. In een verregaande versimpeling kan de zeespiegelstijging zoals die de afgelopen eeuw heeft plaatsgevonden beschreven worden door een eenvoudige, lineaire, trend. Versnellingen in zeespiegelstijging vinden plaats als de trendwaarde toeneemt, of een hogere orde regressiecoëfficiënt nodig is om het gedrag van de zeespiegel te beschrijven. Des te beter het 'natuurlijke' patroon in zeespiegelstijging (over de afgelopen eeuw) beschreven kan worden, des te beter (en eerder) versnellingen ten opzichte van dit patroon gedetecteerd kunnen worden. Het doel van dit proefschrift is te bepalen hoe goed specifieke patronen in zeespiegelstijging gedecteerd kunnen worden, ondanks de beperkte kwaliteit van de beschikbare data. Om de doelstelling van dit proefschrift te verwezenlijken zijn erg lange tijdreeksen met zeehoogtes nodig. Om die reden is alleen gebruik gemaakt van peilschaaldata en niet van zeehoogtes bepaald door satelliet radar altimetrie. Een peilschaal produceert zeehoogtes relatief ten opzichte van het peilmerk bij de peilschaal. Hierdoor bevat de verkregen meetreeks niet alleen veranderingen in absoluut zeeniveau, maar ook de verticale bewegingen van de peilschaal zelf. Door hoogteverschillen te registreren tussen het peilmerk en een stabiel referentiepunt kunnen de relatieve zeehoogtes die de peilschaal produceert omgerekend worden naar veranderingen in absoluut zeeniveau. Helaas is het in de praktijk erg moeilijk (zo niet onmogelijk) om een referentiepunt te vinden dat daadwerkelijk stabiel is over langere tijdsperiodes. Hoe goed het patroon waarmee zeehoogtes variëren gedetecteerd kan worden hangt af van drie factoren: van de veranderingen in het zeeniveau zelf, van de kwaliteit van de peilschaalmetingen en eventueel nog van de kwaliteit van de geodetische metingen die gebruikt zijn om peilschalen in hoogte aan te sluiten aan een lokaal referentiestelsel. Uit literatuur die over deze onderwerpen verschenen is, is getracht inzicht te krijgen in deze verschillende factoren. Weinig informatie bleek voor handen te zijn over lang-periodieke fluctuaties (periodes langer dan 20 jaar) in zeehoogtes. Uit analyse van peilschaaldata blijkt echter dat deze langgolvige effecten wel degelijk aanwezig zijn. De resultaten in dit proefschrift zijn gebaseerd op jaargemiddeldes. De kwaliteit van deze jaargemiddeldes hangt niet alleen af van de kwaliteit van de individuele metingen, maar ook van de frequentie waarmee de metingen zijn uitgevoerd. Omdat lange meetreeksen nodig zijn, wordt ook gebruik gemaakt van historische data. Daarom is niet alleen de kwaliteit die bereikt kan worden met het nieuwste type peilschalen interessant, maar is het ook belangrijk om de kwaliteit te kennen van de metingen die in het verleden gedaan zijn. Hoofdstuk 2 bevat een overzicht van de zes meest gebruikte types peilschalen, hun kwaliteit en hun specifieke eigenschappen en tekortkomingen. Op basis van informatie die voor Nederlandse peilschalen beschikbaar is, is in dit hoofdstuk ook beschreven hoe de relatie is tussen de kwaliteit van het jaargemiddelde en het aantal dagelijkse metingen. Als voor meerdere peilschalen data beschikbaar is, dan kan dit gebruikt worden om een gezamenlijke curve in zeespiegelvariatie uit te rekenen, die bijvoorbeeld het gedrag van het zeeniveau langs de Nederlandse kust weer geeft. Peilschalen bepalen zeehoogtes ten opzichte van het lokale peilmerk. Als de peilschalen in hoogte ten opzichte van elkaar bewegen, dan ontstaan hierdoor afwijkingen tussen de verschillende meetreeksen. Dit beïnvloedt op zijn beurt de kwaliteit van de gezamenlijke curve die uit deze datasets bepaald wordt. Zolang onderlinge hoogteveranderingen tussen peilschalen seculair van aard zijn, kunnen de gezamenlijke fluctuaties in zeeniveau nog steeds goed bepaald worden met behulp van een techniek als Singular Value Decomposition. Het is dan echter niet langer mogelijk om een goede schatting te maken van de trend in zeespiegelstijging langs de Nederlands kust. Door alle peilschalen regelmatig in hoogte te koppelen aan het nationale referentiestelsel (NAP), kunnen de relatieve veranderingen in gemeten zeehoogte ten gevolge van hoogteveranderingen van de peilschaal t.o.v. NAP uit de data geëlimineerd worden. Bij voorkeur vindt permanente registratie plaats van eventuele hoogteveranderingen van de peilschalen, wat echter pas sinds een aantal jaren mogelijk is. Tegenwoordig kan namelijk een permanente GPS ontvanger bij de peilschaal geplaatst worden. In het verleden konden hoogteverschillen alleen bepaald worden door middel van waterpassen. Hoofdstuk 5 geeft een beschrijving van de kwaliteit van drie geodetische technieken, waterpassen, GPS, en gravimetrie, die gebruikt kunnen worden om hoogteveranderingen van peilschalen te meten. Alle drie deze technieken hebben zo hun specifieke tekortkomingen als ze gebruikt moeten worden om hoogtes van peilschalen te controleren. Gravimetrie is niet erg geschikt om hoogteverschillen te bepalen, aangezien een gemeten verschil in zwaartekracht zowel het gevolg kan zijn van een hoogteverandering als van een massaverandering. Als GPS gebruikt wordt, dan kunnen onzekerheden in de metingen teruggebracht worden tot waardes kleiner dan 1 cm. Helaas kan de kwaliteit van met GPS bepaalde hoogtes in havens vaak relatief slecht zijn, bijvoorbeeld ten gevolge van interferentie met signalen van communicatieapparatuur. Een voordeel van GPS is weer dat ook over lange afstanden hoogteverschillen min of meer continu bepaald kunnen worden. Helaas zijn GPS metingen pas sinds enkele tientallen jaren beschikbaar. Waterpasgegevens zijn beschikbaar sinds het begin van de 19e eeuw. Met behulp van waterpassen kunnen hoogteverschillen met een zeer goede precisie bepaald worden. Dit gaat echter alleen op bij korte afstanden. Over langere afstanden is waterpassen erg gevoelig voor systematische fouten. In het verleden zijn peilschalen in hoogte gekoppeld aan het nationale referentiestelsel. Tussen sommige van deze nationale referentiesystemen zijn ook hoogteverschillen bepaald. Het hoogteverschil tussen West Europa en Engeland of Scandinavië is pas voor het eerst bepaald in het tweede Europese waterpasnetwerk (UELN-73). Helaas bestaat zowel de connectie tussen Scandinavië en Europa als de aansluiting tussen Engeland en West Europa slechts uit één gewaterpast traject. Het gevolg hiervan is dat fouten in deze aansluitingen niet gevonden kunnen worden door toetsing. In hoofdstuk 7 wordt een indirecte methode beschreven om verticale datums in hoogte met elkaar te verbinden. Deze methode resulteert in verschillen in dynamische hoogte tussen fundamentele stations in de verschillende gebieden. Het voordeel van deze methode is dat ook de kwaliteit van de hoogteverschillen (zowel precisie als betrouwbaarheid) bepaald kan worden. Het nadeel van deze methode is dat om hoogteverschillen met een goede kwaliteit te krijgen ook een geopotentiaalmodel van zeer hoge kwaliteit nodig is. Pas als een nieuw model beschikbaar komt (te verkrijgen uit de geplande GOCE satelliet missie) kunnen hoogteverschillen tussen datumzones bepaald worden met standaardafwijkingen van ongeveer 1 cm. De kwaliteit van een geschatte curve door een meetreeks van zeehoogtes hangt ook af van de techniek die gebruikt is om de curve te schatten. In dit proefschrift zij een aantal technieken onderzocht op hun toepasbaarheid bij het analyseren van zeespiegelfluctuaties. De gebruikte tijdreeksen met zeehoogtes hebben namelijk een aantal specifieke kenmerken. Om een paar voorbeelden te noemen: ze zij niet stationair, de kwaliteit van de metingen is niet constant, en ze bevatten een groot aantal periodieke fluctuaties die niet noodzakelijkerwijs een vaste frequentie en amplitude hebben. Door deze specifieke eigenschappen blijken de meeste van de onderzochte technieken niet goed toepasbaar op reeksen met zeeniveaus. De beste technieken om een meetreeks te smoothen blijken moving average smoothing en Singular Spectrum Analysis, terwijl extrapolatie van de meetreeks het beste kan gebeuren met behulp van AR(I)MA modellering of regressie. Om te bepalen hoe goed specifieke curves gedecteerd kunnen worden, zijn voor dit onderzoek experimenten uitgevoerd met een groot aantal tijdreeksen met gesimuleerde zeehoogtes. Deze gesimuleerde data sets zijn opgebouwd uit de gesimuleerde curve (bijv. een lineaire trend), periodieke fluctuaties (gebaseerd op echte peilschaaldata) en toegevoegde fouten. Dit kunnen meetfouten zijn geïntroduceerd door de peilschalen zelf, fouten die voortkomen uit hoogteveranderingen van de peilschalen (waar niet voor gecorrigeerd is) of onnauwkeurigheden in de hoogteaansluitingen van de peilschalen. Gekeken wordt of door middel van regressie de originele variatiecurve uit de (gesimuleerde) metingen terug gevonden kan worden. Hierbij dient opgemerkt te worden dat als regressie coëfficiënten bepaald worden die statistisch significant zijn, dit geen garantie is dat de 'echte' variatiecurve gevonden is. Ter illustratie, als lineaire regressie toegepast wordt op een kwadratische curve, dan is het goed mogelijk dat de geschatte trendwaarde statistisch significant is. Om deze reden worden in dit proefschrift trendschattingen vaak getoond als functie van het aantal waarnemingen waarop ze gebaseerd zijn. Voor het genoemde voorbeeld geldt dat geschatte trendwaardes gestaag zullen stijgen naarmate meerdere schattingen gebaseerd worden op meer waarnemingen. Slechts als het model van een lineaire trend past bij de data (en voldoende waarnemingen beschikbaar zijn) zullen trendschattingen zich stabiliseren rond de trendwaarde waarop de tijdreeks daadwerkelijk gebaseerd is. In hoofdstuk 4 worden experimenten uitgevoerd met een enkele meetreeks. Als, in een hypothetisch geval, alle lang-periodieke fluctuaties uit de data geëlimineerd kunnen worden, dan is de detecteerbaarheid van een lineaire trend nog slechts afhankelijk van de trendwaarde zelf en het ruisniveau van de metingen. Zelfs als de metingen meetruis bevatten met een standaardafwijking van 5 cm, blijkt 35 jaar data voldoende om een trend van 1,5 mm/jaar te detecteren. Als de gesimuleerde tijdreeks periodieke fluctuaties bevat gebaseerd op data voor peilschaal Den Helder, dan blijkt dat minimaal 90 jaar data nodig is voordat de trendschattingen zich stabiliseren rond de trendwaarde waarop de meetreeks gebaseerd is. Het kan dan ook geconcludeerd worden dat de aanwezigheid van lang-periodieke fluctuaties in peilschaaldata de beperkende factor zijn voor het aantal jaar data dat nodig is voor een stabiele trendschatting. In hoofdstuk 6 worden gezamenlijke variatiecurves in zeeniveau langs de Nederlandse kust geschat, gebaseerd op meetreeksen voor zes peilschalen. Om de invloed van onderlinge hoogteveranderingen van de peilschalen uit deze gezamenlijke curve te elimineren, worden alle peilschalen in hoogte aangesloten aan nap. Onnauwkeurigheden in deze hoogteaansluitingen introduceren op hun beurt weer verschillen tussen de meetreeksen. Aangezien het erg moeilijk te achterhalen is wanneer hoogteaansluitingen van peilschalen daadwerkelijk hebben plaatsgevonden, en vooral wat de kwaliteit hiervan is, zijn hoogtefouten gesimuleerd op basis van een aantal scenario's. Uit experimenten met verschillende scenario's van hoogteaansluitingen blijkt dat de kwaliteit van de gezamenlijke curve niet alleen bepaald wordt door de precisie van de hoogteaansluitingen, maar ook door hun frequentie. Naarmate het ruisniveau van de hoogteaansluitingen groter wordt, geldt steeds meer dat langere periodes tussen de aansluitingen zorgen voor een schatting van de gezamenlijke trend die steeds slechter wordt. Om toekomstige versnellingen in zeespiegelvariatie op te sporen moet ook historische data gebruikt worden. Uit experimenten met gesimuleerde data blijkt dat als er in het verleden vrij veel tijd heeft gezeten tussen opeenvolgende hoogteaansluitingen, de precisie van toekomstige hoogteaansluitingen (binnen zekere grenzen) nauwelijks meer van invloed is. Een verbetering in de standaardafwijking van toekomstige aansluitingen van 2 cm naar 5 mm, of permanent metingen in plaats van 10-jaarlijkse campagnes, blijkt nauwelijks invloed te hebben op de resultaten. Als laatste is ook, voor het Noordzee gebied, gekeken hoe goed een ruimtelijk patroon in variaties in zeespiegelstijging bepaald kan worden op basis van data van 18 peilschalen. Zo'n ruimtelijk patroon zou gebaseerd moeten zijn op daadwerkelijke verschillen in trendwaardes voor de verschillende locaties, en niet het gevolg moeten zijn van meetfouten en van hoogteveranderingen tussen de peilschalen zelf. Gebaseerd op experimenten met gesimuleerde meetreeksen, zijn de volgende conclusies getrokken. Als peilschalen eens in de 10 jaar aangesloten zijn aan een lokaal referentiestelsel, dan zijn fouten in trendwaardes (als een functie van de locatie) drie keer zo groot als de fouten die voorvloeien uit jaarlijkse aansluiting. De fundamentele stations in de datumzones zullen ook in hoogte ten opzichte van elkaar bewegen, bijvoorbeeld als een gevolg van post-glacial rebound. Als de individuele meetreeksen (die in hoogte gekoppeld zijn aan de lokale datums) niet voor deze hoogteveranderingen worden gecorrigeerd, dan ontstaan hierdoor grote vertekeningen in het spatiele patroon dat door de trendwaardes geschat wordt. Als hoogteverschillen tussen de datumzones gebaseerd worden op gegevens uit de Europese waterpasnetwerken, dan ontstaan hierdoor fouten in geschatte trendwaardes (als functie van hun locatie) die veel groter zijn dan de fouten veroorzaakt door de verticale bewegingen van de fundamentele stations Amsterdam, Newlyn en Helsingborg. Dit geldt ook als hoogteveranderingen bepaald worden met behulp van GPS, terwijl deze metingen een standaardafwijking hebben van 1 mm/jaar. Kortom, zolang de meetprecisie van beschikbare methoden om de hoogteaansluiting te verrichten niet verbetert, is het beter om niet te corrigeren voor de hoogteveranderingen tussen de genoemde fundamentele stations.